"A Restored Baggage Cart of Trains Pre-War O Gauge, Circa 1918-1932. 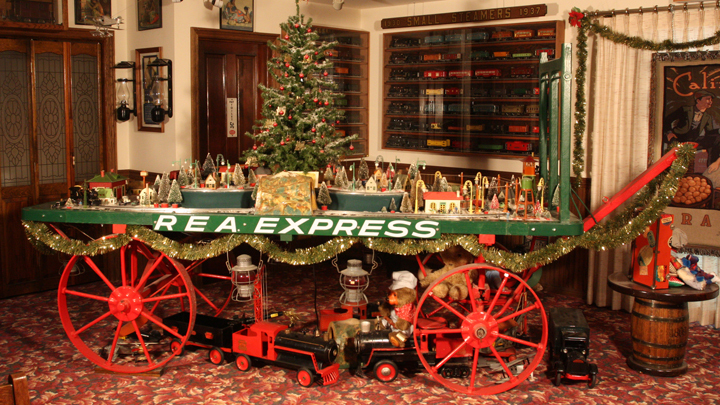 What was once a small oval of a train layout on our dinning room table each Christmas has grown into a baggage cart layout with a Lionel #150 engine and passenger set (circa 1917) on the top, and a #262 steam freight set from 1931 on the bottom. 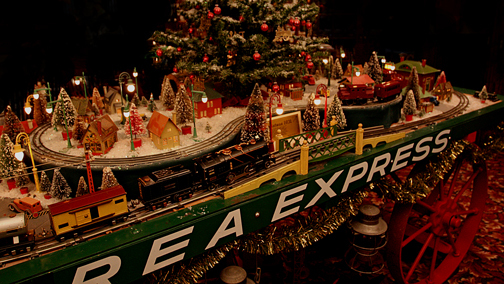 All of the accessories are Lionel and date to the same time period as the trains. 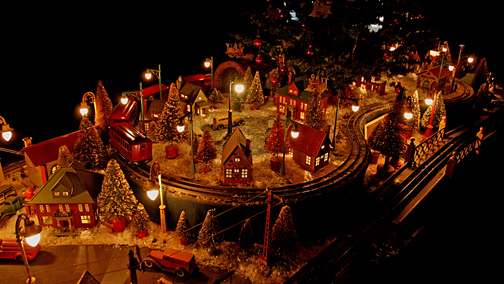 Lionel metal houses in the middle of winter along with early lamps and telegraph poles surround the layout. Can you hear the whistle of #262 coming in for a passenger stop after passes through a brass tunnel and returns over a #106 ramp bridge (3-pieces). 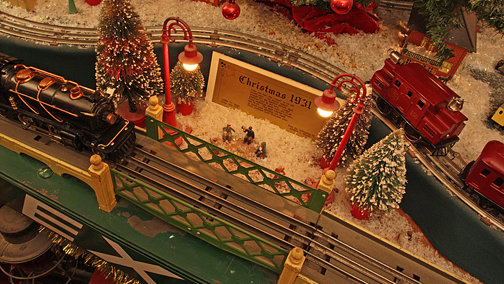 The Baggage cart is from the L&N and Southern R.R. that ran through Mascoutah, Illinois. 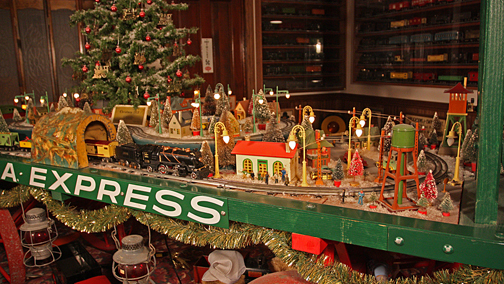 Bought at auction, a year to restore it, adds to the charm to the layout. What is truely unique about this layout is that it proves that you don't need a large area to have fun with Toy Trains. The size of the bagage cart is 9' 6" long and 40" wide. With a little planning (and a lot of creativity) you can do just about any type of sceen you like. This last picture shows a night time view with streetlights and homes lighted." It appears that some HOBO's are using the bridge to have a campfire and wine testing event. For these younger folks who may not have heard about HOBO's, they were generally honest folks who did not have the money to get to an area where they could pick apples, peaches, or any place where they could earn some money for hard work. They would ride on freight trains (when they could) for free passage to the place of employment.